The skyline and architecture of Boston has changed dramatically over the last decade. New skyscrapers and building go up everywhere. The Seaport District and East Boston are booming providing new office and apartment space for The Hub. I love visiting East Boston and enjoying the view of the Boston Waterfront skyline at twilight. Sunset and sunrise provide pristine photography condition too. There is a brief moment at twilight when the city lights and sky are in harmony and at their best. It's this favorite time of day when I release the shutter. In this Boston Photography image I opted for a tighter more intimate composition. The Custom House of Boston or Marriott Hotel dominates the view while the skyline reflection and the pier provided a great foreground, leading the viewer towards the impressive Boston Harbor skyline. A Canon Mark IV camera with a 24-70mm wide-angle zoom lens was set at 59mm with an aperture of f/8 allowing for an exposure time of 10 second at ISO200. 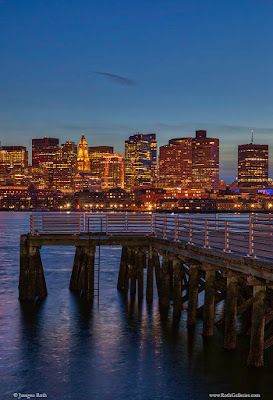 During routine post processing I adjusted noise levels, contrast, brightness, and saturation before removing image imperfections and sharpening the final photograph of Boston Waterfront Skyline. Join my NEWSLETTER for special photo wall art print promotions and photography events, thanks.